AAA announced on September 29, 2017 that the European Commission (EC) has approved the marketing authorization of lutetium (177Lu) oxodotreotide* (Lutathera®) for “the treatment of unresectable or metastatic, progressive, well differentiated (G1 and G2), somatostatin receptor positive gastroenteropancreatic neuroendocrine tumors (GEP-NETs) in adults.” This approval allows for the marketing of lutetium (177Lu) oxodotreotide* (Lutathera®) in all 28 European Union member states, as well as Iceland, Norway and Liechtenstein. A New Drug Application is currently under review by the US Food and Drug Administration. The Prescription Drug User Fee Act (PDUFA) action date is January 26, 2018. Click here to read the company press release or here to read the EU approval. The U.S. Food and Drug Administration today approved Xermelo (telotristat ethyl) tablets in combination with somatostatin analog (SSA) therapy for the treatment of adults with carcinoid syndrome diarrhea that SSA therapy alone has inadequately controlled. “Today’s approval will provide patients whose carcinoid syndrome diarrhea is not adequately controlled with another treatment option,” said Julie Beitz, M.D., director of the Office of Drug Evaluation III in the FDA’s Center for Drug Evaluation and Research. This new treatment is now available by prescription and will be in select specialty pharmacies beginning March 6, 2017. To read more about the approval click here for the FDA's release or here for the Lexicon press release. For those needing information on how to getting Xermelo please click here. The White House released a 2018 budget outline on March 14, 2017 that cuts National Institutes of Health (NIH) spending by nearly 20 percent. NorCal CarciNET shares the concern expressed by other cancer-related organizations and our collaborators that a funding decrease of this magnitude could disrupt, even derail, America’s cancer investigators and research institutions. These cut will amount to nearly $100 million shortfall to UCSF and Stanford only according to the San Francico Chronicle. These cut include a nearly $1.2 billion dollar cut for the NIH in FY2017. More than 80 percent of the $32 billion NIH budget is awarded to universities, medical schools and other research institutions through a competitive grant process. NIH grants often comprise a significant portion of an institution’s or individual investigator’s funding. Speaking Up: What stands in the way of patient-physician conversation about neuroendocrine tumors and carcinoid syndrome? 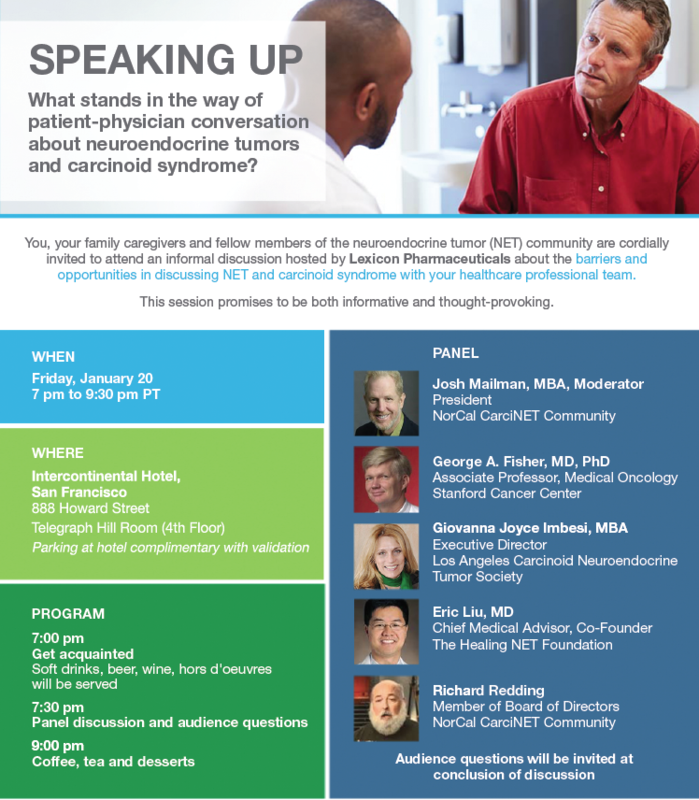 You, your family caregivers and fellow members of the neuroendocrine tumor (NET) community are cordially invited to attend an informal discussion hosted by Lexicon Pharmaceuticals about the barriers and opportunities in discussing NET and carcinoid syndrome with your healthcare professional team. This session promises to be both informative and thought-provoking. Valet parking at the hotel will be validated.